Known Relatives: Gloria (daughter), Destroyer(s) of Demons (unidentifed father and a lot of ancestors). 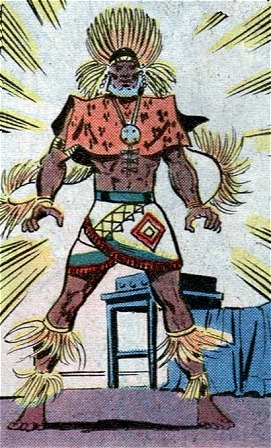 Powers/Abilities: Wearing the Mystic Amulet of Yoruba, Rev. Joshua became a magically powerful Destroyer of Demons. He could launch magic blasts able to tear apart demons. He could track down demons and was impervious to hellfire and to other Satan-spawned and demon-spawned sorcery. He also acquired strength and an agility superior to the average level, enabling him to jump from the roof of a building to another. History: (Ghost Rider II#60 - (fb)) - When he was young, Joshua received from his aged father the Sacred Amulet of Yoruba, and thus the heritage to seek out demons and annihilate them. (Ghost Rider II#60 - (fb) - BTS) - Joshua never used the amulet, though as he grew to manhood he revered it and the costume as treasured mementoes of a proud and noble heritage. He became Reverend Joshua, a Pastor in the little Church of Living God, in Chicago. He had a daughter, Gloria, who left the congregation on bad terms with her father. Rev. Joshua was saddened that his daughter associated with a gangster named Williamson. 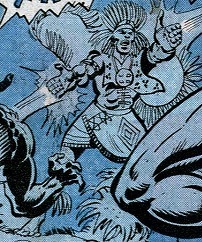 (Ghost Rider II#60) - One evening, a man was hurled into Rev. Joshua's church, smashing a window. Rev. Joshua strode to the door and saw the Ghost Rider, identifying him as a demon. Secretly, the pastor wore the holy amulet and the ritual costume of the Destroyer of Demons. He searched for the demon in the town. 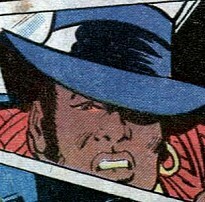 Shortly after he saw Johnny Blaze and recognized the demon inside him. The Destroyer of Demons attacked Blaze with magic blasts. Blaze let Ghost Rider emerge, but Joshua's power was awesome and stunned the demon, who fled on his flaming bike. At the church, Rev. Joshua received the visit of her daughter. She wanted to help his church giving him some money, but he refused because Gloria's money came from a criminal. Joshua wore again his mystic amulet and thanks to its power reached the Ghost Rider. 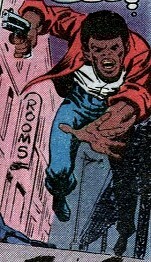 He attacked the demon, not knowing that the Rider was trying to defuse a bomb placed in the subway by Williamson's lackeys. Ghost Rider's soul-searing hellfire enveloped the Destroyer of Demons but had no effect on him. Again, Joshua hit the flaming Demon, who, at last, succeeded in finding the bomb and hurling it far in the sky where it exploded without harming anyone. The Destroyer of Demons understood that he was wrong about this demon. (Ghost Rider II#60 - BTS) - Williamson and his men were arrested. (Ghost Rider II#60) - The morning after, Joshua and Gloria said hello to Blaze. (Civil War: Battle Damage Report) - Tony Stark considered the Destroyer of Demons as a potential Initiative recruit. Comments: Created by Michael Fleisher (writer), Herb Trimpe and Don Perlin (artists). If the Amulet also works with a woman, Gloria has the potential to become another Destroyer of Demons. There is apparently some Leopard God associated with Tarzan, who has been shown to be in-continuity, though essentially unusable due to being licensed. There are other vague references to worship of a leopard god in Africa...you can search the net for more specific information. Since "black panthers" are actually black leopards, this could easily refer to Bast, the Panther God of Wakanda. Thanks to Hans Holm for pointing that out...I must have had some sort of brain fart to have not thought of that! The leopard god could also be Osebo (Wikipedia info). 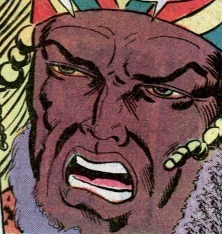 He's an obscure African deity with little known about him. Reverend Joshua's last name was revealed in the Civil War: Battle Damage Report. any other "Destroyer" or "Slayer" or "Black" character. any other "Williams" or "Williamson" character. Gloria has no known connections to any other characters with a similar name. Stanley has no known connections to any other characters with a similar name. any other "Billy" or "Boy" character. The Destroyers of Demons belonged to the Yoruba people, an African tribe, and were magic users. Their task was to destroy demons. The title of Demon-Slayer passed from father to son over the centuries. The first Destroyer of Demons received the Sacred Amulet by a wise and aged witch doctor who had received it from the hands of the Leopard God in the very heart of a sacred mountain cave in Africa. The first Demon-Slayer started his work in ancient times, before the written records, and slew a lot of demons with single powerful blasts of magic. When he died, his son took the amulet, the tribal costume and also his place. The heritage went along from father to son for centuries and for thousand of miles until Joshua's father. Joshua's father was born a slave. He taught to his son the story of his ancestors and of the amulet. When he died, his son became the new Destroyer of Demons. Gloria was the daughter of Reverend Joshua. She seemed a normal human. Gloria left the congregation led by his father, Reverend Joshua, and went to stay with Ron Williamson. She liked him and didn't see the gangster under the businessman. Gloria visited his father at the church. He refused the money she tried to give him because it came from Williamson. Shortly after, she met Williamson who told her his plan about blackmailing the City Hall. She fled when she understood how cruel and criminal he was. Two henchmen tried to kidnap her, but Johnny Blaze stopped them, then she gave him the directions about where the bomb has been placed. The Ghost Rider succeeded in saving the people in the Train Station. Ron Williamson was a normal human. He was a gangster. Williamson covered his criminal activities under a businessman appearance. He also deceived Gloria, Rev. Joshua's daughter and his favorite girl. Williamson planned to blackmail the city of Chicago. He sent Stanley and Billy Boy to steal some dynamite. Then, sent Joe and Mike to set up the explosive in a train station. He wanted to take Gloria with him to Detroit to have an alibi when the bomb would have exploded but when he explained his purpose to the girl, Gloria fled and he ordered to his henchmen to kidnap her. Williamson wanted to spread terror in the town and ask ten millions of dollars to Chicago else he had made explode another bomb. Ghost Rider saved the people in the station and Williamson was arrested. Stanley was a normal human. He was a burglar. Stanley and Billy were sent by Williamson to steal some dynamite. A policeman arrived on the crime scene, Stanley shot at him while Billy escaped with the explosive. Running away, Stanley stole Johnny Blaze's bike. He was pursued and caught by the Ghost Rider who launched him through the window of the Church of the Living God. Stanley smashed the window, scaring the ladies of the church. Reverend Joshua called an ambulance for him. Billy Boy was a normal human. He was a burglar. Stanley and Billy were sent by Williamson to steal some dynamite. When a policeman arrived on the crime scene, Billy escaped with the explosive and brought it to Ron Williamson. Billy gave the dynamite to Joe and Mike.